The sequel to hit arcade action game Tiny Gladiators has just been released for mobile by BoomBit Games. Tiny Gladiators 2 comes with single player mode as well as PvP mode in which you fight against enemy teams for the chests and coins. Additionally, the game offers fast combat mechanics; only a few minutes to complete the battle. As of now, Tiny Gladiators 2 lets you play as an archer, mage, and warrior. There are over 20 skins available to unlock for the characters. If you are having the trouble mastering the game’s mechanics, then our Tiny Gladiators 2 guide and Tiny Gladiators 2 tips, cheats & strategy will help you. Tiny Gladiators 2 is all about developing the heroes by upgrading skills, stats and mastering the characters’ movements in the battle. By winning the battles, you earn chests. And, from these chests, you get weapons, armors, and more gears for your character. Gears come in different grades; common, epic, rare, and legendary. Higher quality gears increase the hero’s stats by a massive amount. Duplicate cards of these gears used in upgrading and evolving. Since chest slots are limited, the game bounds you to upgrade the heroes fast. You can either wait or watch the video ad to reduce the opening time. Or, you can also spend diamonds. You can earn diamonds from the campaign mode, high-grade chests or as a ranking reward. Rankings in the PvP mode also matter a lot. Climbing to a high division in PvP rankings rewards you perks; increase the chances of getting additional rewards from the chest. In addition to the campaign, PvP, clan feature is also available and lets you access the boss raid mode. So that’s the overview of Tiny Gladiators 2. 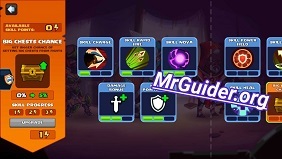 Let’s take a look at the guide and then tips, cheats & strategy! There are three character classes you will control in the battle. Archer is a long-ranged character and attacks from a long range. Warrior is a melee type character who attacks from a close range, while Mage is a ranged character with magic skills. All these characters can carry four type of gears; armor, weapon, helmet, and accessory. The grade or stats of these items also impact the overall stats of heroes. You can further develop these gears by upgrading and evolving. It will cost you gold coins. You may want to know the total power of your team when the game prompts you to join a clan. And, almost all the clans have minimum power criteria on the basis of which they recruit players. To check the total power, tap the clan button on the left side of the screen. This will expand the side menu and you can check the total team power at the top-right corner. 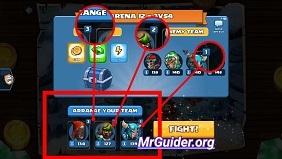 How To Increase Team Power In Tiny Gladiators 2? You can increase the team power by equipping high-quality gears, upgrading/evolving the gears. To get the high-quality gears, focus on the campaign mode and complete the stages to earn chests. Additionally, don’t forget to open the free chests(sponsored chest), champion chest – winning 10 battles reward you a champion chest. You can unlock a variety of skills for archer, warrior, mage, and for additional passive buffs using the skill points. The game gifts these skill points whenever you clear a new stage in the campaign mode. Keep in mind that repeating the stage does not grant skill point. So make sure to spend these points wisely. How To Unlock Hero Skins? There are seven outfits for each character. You can unlock these skins by gathering enough skin parts. You get skin parts from the chests. Before you proceed into the battle, you can customize the character formation. For example; if you want to play as an archer first, then put the archer in the first slot. Customize the team formation according to your game style. If you’re playing as a warrior and the enemy is of mage or archer type, then keeping yourself away would not help you as these characters deal massive damage from a long range. As a warrior, you should go close and rapidly strike the enemy. On the other hand, if you are playing as an archer or mage and the enemy is a warrior, then try to keep yourself away as the warrior’s attack range is short. Dodge the enemy attacks by jumping, use the skills to deal massive damage. Repeating the campaign mode stages would not give you skill points, diamonds, coins, but you can earn chests. Usually, you get normal chests from these stages. And, you can open these chests instantly by watching the video ad. The regular chest contains up 60 coins, 10 diamonds, and 97 cards. So repeating the stages would be helpful. Go to the shop menu -> head to the diamonds tab -> watch a short video ad to earn diamonds. Joining a clan lets you access the boss raid mode. You must have at least 400 team power to play this mode. In this mode, clan members fight against a mighty boss and can earn diamonds. The HP of the boss is very high and the time is limited. Defeat the boss as soon as possible to get diamonds. You get the second turn after four hours or spend diamonds to fight again. In the shop menu, you can get some items in exchange for coins and diamonds. If there is a worthy deal available, grab it asap. Make sure to check this section daily. Defeat players in the PvP mode to rank up. The victory also rewards coins.